Current Affairs News | Can the International Solar Alliance change the Game? Can the International Solar Alliance change the Game? Home > Blog > Can the International Solar Alliance change the Game? 25 Oct Can the International Solar Alliance change the Game? Background:The International Solar Alliance (ISA) was jointly announced by Prime Minister Narendra Modi and French President François Hollande in 2015 at the UN Paris Climate Change Conference. Since then the International Steering Committee has met thrice (in Paris, Abu Dhabi and New York); an Interim Administrative Cell (formed in January 2016) meets regularly; and an ISA ministerial-level meeting was held at the UN Headquarters in April 2016. Two multi-country work programmes have been launched; India has committed financial support worth Rs.400 crore; the foundation stone for the ISA headquarters was laid in Gurugram; and joint declarations were signed with the UN Development Programme and the World Bank. Despite the ball moving behind the scenes, public understanding about ISA’s role, scope, and future direction remains limited. Prospective member countries want to know when to sign up. Detractors ask what’s in it for members. Can ISA change the game? Several countries have aggressive solar targets and regional and international organizations are hoping to support these aims. Yet, although the sun shines everywhere, solar power remains concentrated in just a few countries. Until December 2015, Germany, China, Japan, the U.S., and Italy accounted for 70 per cent of the 227 GW of solar PV deployed globally. Developing countries, especially in Africa, are still left out or stuck with low-tech options, despite their significantly larger solar potential. These nascent markets are seen as too disaggregated and high risk for investors. In effect, three factors continue to block the rapid scale-up of solar energy: financing is still too costly for developers; solar-related plans and policies are often incoherent and increase risks for developers and investors; and there is insufficient research and development (R&D) investment in solar. ISA’s vision and mission is to take solar from the lab (or rich world markets) to (developing country) streets. It is being designed as a platform to bring together countries with rich solar potential (along with solar innovators, developers, and financiers) to aggregate demand for solar across member countries, creating a global buyers’ market for solar energy, and thereby reducing prices, facilitating the deployment of existing solar technologies at scale, and promoting collaborative solar R&D and capacity. The cost of finance for solar projects in many developing countries is often prohibitively high. ISA envisions that collective measures can facilitate the flow of over $1 trillion into solar projects, by aggregating demand within countries, standardized asset-structuring across countries, and establishing an ecosystem of financial instruments to mitigate some of the investment risks. For instance, a multi-country foreign exchange hedging facility could remove one of the biggest contributors to higher costs of finance for countries whose currencies are not pegged to internationally traded currencies. Investors could also reduce their exposure to risk by investing in bankable but coordinated portfolios of projects across several markets. Many technology applications are already commercially viable, if promoted through innovative business models (such as fees-for-service for solar home systems, community ownership of assets like solar pumps, etc). Decentralizedenergy businesses might not scale in the traditional sense, but could be replicated across many geographies. Warehousing (aggregating) demand for rooftop solar projects across countries is one example. ISA has already launched a major programme on scaling solar applications in agriculture and has another proposed programme on financing for off-grid energy access. 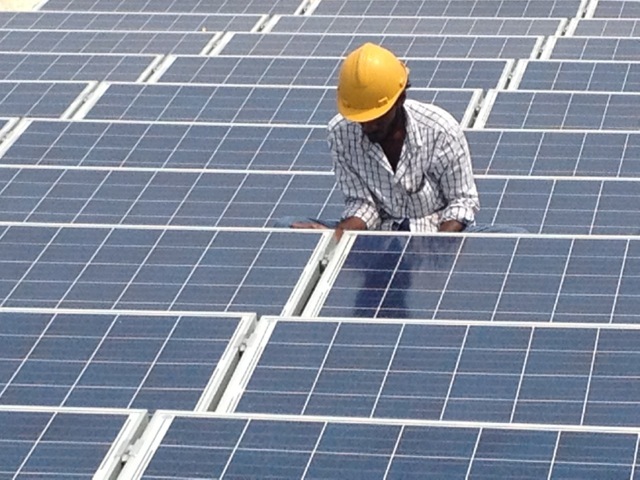 But even large-scale solar projects would benefit from better coordination among member countries. Investors are likely to draw more confidence in a group of countries that followed similar procedures on, say, reverse auctions to allocate solar projects, or standardized templates for power purchase agreements. Developers could find opportunities to scale operations in other countries. ISA could help to coordinate these policies. Since programmes would be member-driven, there is little risk that the institution would be accused of impugning the sovereignty of members. Third, in order to avoid the trap of getting locked into existing technologies, there needs to be collaborative, cross-country R&D, which ISA hopes to facilitate. Whereas the major solar powers are already investing in R&D, collaborative research would pool resources in cash and kind, and offer more markets in which to test technologies. ISA R&D prizes and advance market commitments could be announced to stimulate research in preselected areas, such as increasing the efficiency of solar panels or reducing the costs of manufacturing in developing countries. Additionally, ISA has plans to address related market-limiting factors, by launching standardized skill training programmes and reducing information asymmetries through a 24×7 knowledge hub. Despite its promise, ISA faces two real dangers. The longer-term one is whether it devolves into a bloated bureaucracy. Although conceived as an intergovernmental institution, ISA is not intended to be a typical international bureaucracy. It’s extremely lean Secretariat (possibly smaller than any other international agency) could leverage networks and create tangible opportunities for manufacturers, developers, financiers and innovators. A tight budget and a direct link to the private sector would hold ISA accountable to real action on the ground. The more proximate danger is that 121 potential member countries get caught up in a battle over legal form, membership rights, and giving precedence to procedure over pragmatism. This would violate the very ethic of a dynamic international organization for the 21st century, where action is rewarded and initiatives judged by the effectiveness of their execution. It is important that the key backers of ISA start speaking loudly, clearly and frequently about ISA’s vision, activities and their added value. There are many interested parties — in governments and in international markets — and we cannot afford for their interest to flag.